With the arrival of the new president, everyone has noted that Iran’s political situation has taken a very bad turn. Unfortunately most people don’t have even a clue as to the extent nor the underlying reasons. I hope to shed some light in the next paragraphs and once again, show why I believe the UHJ’s policy of encouraging Baha’is to remain in Iran is completely wrong and extremely dangerous. Within a few months, Ahmadinejad has swiftly reversed years of careful and painstaking transformation by the moderate outgoing president (Khatami). All the efforts of the previous administration to strike a conciliatory note with the West (“dialogue of civilizations”) as well as the attempts to inject moderation, flexibility, and democracy within Iranian society have been destroyed. Ahmadinejad has already purged all the most important government posts and appointed his own candidates. The one exception being the most important: the head of the Petroleum Ministry, which the Majlis (parliament) has fought tooth and nail – and won. In any case, in all instances where he has been successful, the candidates have shared his particular brand of Islam and were, through and through, fiercely loyal to him and his version of the ideals of the Islamic revolution. As expected, the candidates’ competence were of no consequence. A case in point being the newly appointed president of Tehran University – the first person to occupy the post without having a university education himself. If this pattern of appointing cronies with no competence sounds like another present world leader, wait till you see the other similarities. Other ominous changes in Iran have occured with blurring speed. Small changes, like the removal of all foreign language signage in airports, as well as large ones; the imposition of a strict dress-code with renewed vigour; extreme limitations on the press and media; and renewed censorship of the arts (movies, music, etc.). On the surface, the intention of Ahmadinejad is to take Iran back to the ‘purity’ of the first months of the Islamic revolusion under Khomeini. But what is underlying all these changes? And who is Ahmadinejad anyway? How did someone so unknown, with such little political experience and capital, sweep so quickly to the top at the ballot box? To answer these questions, we have to go back more than 50 years into Iran’s past – back to the establishment of a semi-secret society known as the Hojatieh. They were the fundamentalists, fundamentalists. If you consider Khomeini a loonie case – take him to the nth degree and you may have an inkling about the Hojatieh. The Hojatieh were mostly made up of the businessmen (bazaar-i) and fanatical mullahs. Among other things, they opposed communists, Marxists, and atheists. Their overarching raison d’?tre, however, was to prepare the world for the coming of the 12th Imam – the Mehdi. These and other activities were added slowly over time. At the moment of its creation in the 1950′s, however, the Hojatieh had but one singular purpose: the elimination of Baha’is. And they carried out their goal with ruthless zeal. From the inception of the organization, countless Baha’is were either killed by them directly or turned in to the authorities, with predictable consequences. They played a very small role in the 1979 revolution and its aftermath – they viciously eliminated the leftist alternative (the Tudeh party) to the Islamic society proposed by Khomeini and they further helped Khomeini by mobilizing their members to vote in the post-revolutionary constitutional referendum. However, immediately afterwards, when their leader refused to accept Khomeini’s wacky thesis of valiat-e-faghih Khomeini had them disbanded. As you can imagine, a society such as the Hojatieh doesn’t simply vanish. The close ties of its members – cemented by years of mercantile exchange – can not be simply erased. So, they quietly went underground and operated towards their goals – except now with the added characteristic of stealth. Much like Opus Dei, the Hojatieh lurked like a shadow in the halls of power. Everyone knew they were around, no one talked about it. Recent events prove that the Hojatieh has not only survived its banishment underground all these years but that it has gained strength and crept to the forefront of the political scene in Iran. Indeed, it has boldly come out into the open and is now busily engaged in molding the political destiny of Iran. Ahmadinejad is one of their most visible and devoted members. And through him, most of the upper ranking officials of the current regime are as well. In the same way that George W. Bush has a spiritual advisor in Billy Graham, Ahmadinejad has Ayatollah Mohammad Taghi Mesbah-Yazdi (the defacto leader of the Hojatieh). He is known for his extremist views on Islam; he condones and promotes suicide bombings, attacks on civilians in the West and once said, ‘if anyone tells you their own interpretation of Islam, punch them in the mouth!’. Recently a cartoonist was jailed and severely beaten when he drew a smiling crocodile – a reference to Mesbah-Yazdi’s features. And much like the Bush administration, Ahmadinejad also demands complete submission and loyalty to his agenda. All high level officials appointed by him have to demonstrate their loyalty by signing documents devoting themselves to the Imam Mehdi – in effect, cementing their Hojatieh identities. 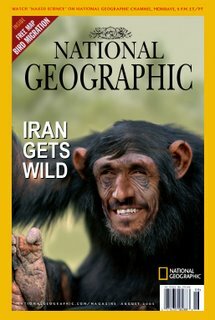 Almost everyone in the West misinterprets the recent extremist speech of Ahmadinejad and blames it on a politically inexperienced man making public gaffes. And surprisingly, in reporting on his speech to the UN, the Western media completely missed the significance of his repeated references to the return of the Mehdi. Most of the audience was dozing off ofcourse, but the fact that the media didn’t pick up on this big clue shows just how much the West is ignorant of the true underlying forces in Iran (for Ahmadinejad’s surreal personal take on his UN speech see the video link below). Everything Ahmadinejad does in his capacity as president is coloured by his religious ideology. In fact, he has gone as far as re-writing history and saying that the sole purpose of the Islamic revolution was and is to bring about the return of the Imam Mehdi. The Hojatieh is extremely dangerous because it subscribes to an ideology of apocalypsism. In the same way that Christian fundamentalists expect the Rapture, the return of the Mehdi is awaited by Shi’ite Muslims. They believe that the conditions for the return of the 12th Imam is a sort of end of days scenario. Imagine: war, pestilence, earthquakes, plagues, etc. To them such events are to be welcomed since only when things are downright nasty will the Imam see fit to return. Most shockingly, some ultra fanatics within this camp even go as far as saying that anything one can do to bring about such mayhem is good since it will perhaps speed up his schedule. If you temporarily subscribe to the ideology of the Hojatieh, suddenly all the puzzle pieces fit together. Would someone who sees the world through this perverse lens be distressed by a runaway drug problem in their country? Not at all. In fact, it would be congruent with their belief system to throw open the border of Afghanistan and let the opium flow freely into Iran (…with the requisite cut of the proceeds, ofcourse). Would someone with such a belief do anything to address other social ills such as unemployment, prostitution, bribery, graft, corruption, etc.? Again, no. If anything they would take clandestine measures to exacerbate the problems. To expect Ahmadinejad to be perturbed by the world’s reaction to his recent outburst regarding ‘wiping Israel off the map’, is to be ignorant of his ideology. Upset? Far from it! He relishes the chaos and confusion… the agitation that such actions produce in the West. If he had his way, it would extend and envelop the whole world – so as to hasten the arrival of the Mehdi. In his perverted view of things, the worse things get, the better! Warning him, chastising him, or threatening him (as the IAEA, the US and Israel have done) is as effective a deterrent as waving a red cloth in front of a bull. Visions of a nuclear holocaust will only bring smiles to his face. This is exactly why, more than ever, it is paramount that the Baha’is leave Iran. The gains that the Hojatieh have made in political circles have garnered them a tremendous amount of power. And we’d be foolish to think for a second that they have forgotten the primary reason they were founded more than fifty years ago. The recent arrests and persecution of Baha’is in Iran are, I’m afraid, only the beginning of a renewed campaign of persecution. Unlike previous administrations in Iran which were reluctantly influenced by international pressure, the perverse ideology to which this one subscribes to allows them to be immune to such forces. Any and all actions taken by the civilized world against the Iranian regime as a consequence of the persecution of Baha’is, will only reinforce the belief system of the Hojatieh and result in their redoubled efforts to sow the seeds of chaos. I pray that I am completely wrong in my understanding of the situation and wholly ignorant of the real political cross currents in Iran. I pray so because if I am right, many Baha’is are in extreme and imminent danger. I beg them to get out, for if I am wrong, the consequence is acceptable. They and their families can build a life in one of many civilized countries in the world and simply go back when Iran’s future changes for the better. But if I’m correct, then the consequences of staying in Iran will be tragic. A recent Channel 4 (British) video story – wait a bit for buffering. 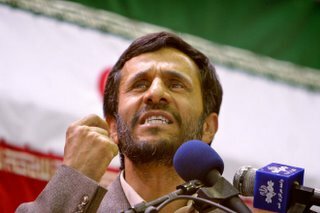 (Persian) Video clip of Ahmadinejad saying how he was enveloped by light in the UN assembly. Recent Baha’i World News articles regarding the increase in persecution of Baha’is (which coincides with the rise in power of the Hojatieh): story one, and two. The Mehdi Hotline (another CSM article) and the story behind the story. Hojjatieh has been infiltrated long time ago, by the same forces that rules this world and their apocalyptic visions (Communism, fascism, revolutions, war). More than 140 millions have died last century under this power ruling humanity. Now called freemasons, zionism, illuminati, hojjatieh or whatever. They have all the same masters at top and they are following their apocalyptic vision. Is amazing, even if they look so much the same, people until recently did not noticed they are interlinked and all part of the same objective. These days, many people are awakening and the masks are falling fast. They have to accelerate their plans as they do not have the same control on people, who are starting to understand their goals and more importantly their names. Despite they control most of the economy, education, media, legal structures, they are a small minority and they will be the first target in the coming years. Brothers will not destroy brothers but will definitely bring an end to this power, started more than 200 years ago. My concern with this is the statement that the UHJ is wrong, I believe is erroneous. This body is divinely guided, and if we cannot understand it is because we cannot know God’s will. The promise of Baha’u’llah is great for Iran. The tests the Baha’is are going through will undoubtedly prepare them for the great reward they will get as a result of their suffering. Tee hee hee unt heil heil heil. This body is divinely guided, and if we cannot understand it is because we cannot know God’s will. Saying its God’s will is a lame excuse for not thinking. Religious zealots say its God’s will all the time, no matter who (UHJ or otherwise) came up with the dumb plan in the first place. They’re just too afraid to wade into the quagmire of deciding whether or not it is God’s plan. God gave us a brain to use. If something doesn’t make sense then more likely than not its daft. No individual or group (UHJ, NSA, LSA included) should ever claim they are divinely guided and use that to get people to follow their daft ideas. Its just like the old days in science where some quacks invoked God’s name or God’s will to lend credence to their ideas because they couldn’t explain things in a rational way. God gave us a brain to use. If something doesn’t make sense then more likely than not its daft. I agree Grover; we must fully use our brains: there is a rational and an emotional part: the one is no substitute for the other. Religion educates our emotions, and should do so in harmony with science and reason. Any religion that opposes reason is prejudice. Once we have fully examined the rational part of reality, then we turn to our emotions for inspiration. Prejudice and fanaticism come in when we let our emotions overrule our reasoning.